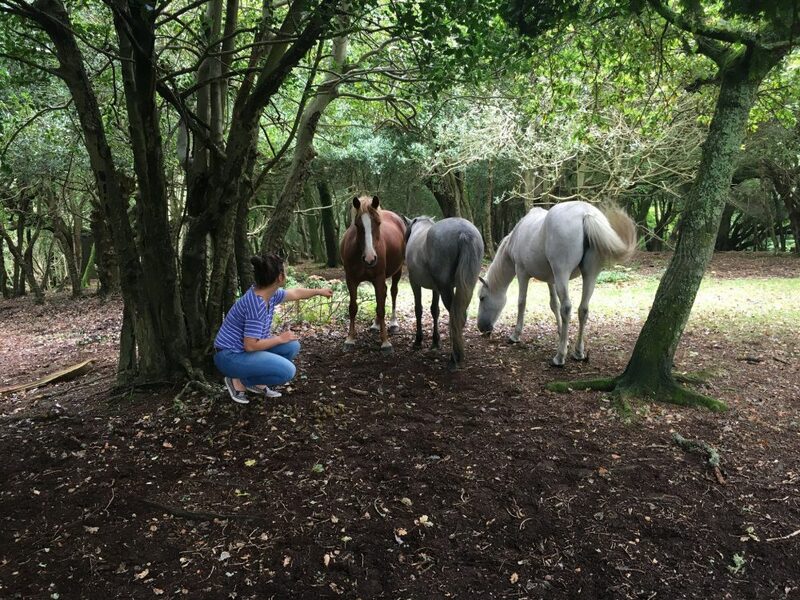 During a recent trip to the UK, I was finally introduced to the New Forest – more importantly, I was introduced to the New Forest Ponies. My sweetie, Tim, a southwest UK native, had been talking about taking me there for ages – “hoards of ponies roam the roads,” I was told. “You’ll love it.” No doubt – I’d spent the last three weeks in various stages of ranch-withdrawal, eased only by random stops to love up curious horses and cows over their pasture fences. Thank god the UK allows dogs in pubs or I’d have lost my mind from sheer lack of animal contact! I was keen to see these free-roaming horses, and intrigued by the casual way people spoke about them raiding picnickers and stopping traffic. The day before I flew out, we drove through the New Forest National Park, a handy 20 minutes from Tim’s home town. The area is not just forest but also open swaths of heather, recreation trails, and several beautiful villages. Used to the vast expanses of western Canada, I was unsure I’d actually get to see any ponies – here, range animals have to be found, sometimes over hours or days. I had no idea what to expect, actually. Within minutes past the park gates, we pulled over into a parking lot full of tiny horses. I’m sure I was out of the van before the engine was off, climbing out in a happy daze and straight into a flock of meditating ponies. In the woods behind us, a family of tourists was feeding another herd out of a bucket (a bylaw violation and a fine-incurring criminal offense, I later learned – I’m sure they didn’t know), causing a mellow sort of chaos as the horses crowded and the people shrieked delightedly. But where we were, the horses all stood quietly, hind legs cocked and eyes closed. They were unfazed by our sudden appearance, and actually seemed to open their circle to allow us to join in. We basked together in the afternoon sun. A few of the more confident horses came forward to sniff us humans, and one small roan mare stayed close. Lazily, as if she’d always known me, she began offering parts of her body to be scratched. Under the chin, around the ears, and yes, please, anywhere on that underbelly. She would tell me exactly where she needed my touch the most with the slightest shift, or by pointing with her mouth, or simply by passing an image. We had nothing that important to say to each other. We stepped effortlessly into an intimacy that I share with my own horses. 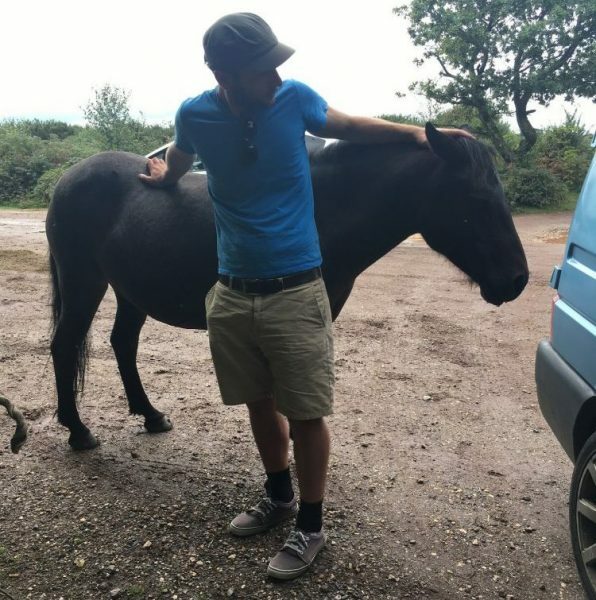 When I moved off to meet the other horses, she wandered over to Tim and politely, confidently wrapped herself around him, apparently content to stay that way as long as he was. Other horses were more wary. As we walked into the woods, we found two other small herds, most of whom had no desire to speak to us. Obviously every horse had had its own experience with humans. After saying goodbye to our little roan friend, we drove further into the park. On a lawn surrounded by stone cottages, beside an automechanic shop, we stopped to snack, surrounded by several mares and a sweet little foal. Locals drove past, patiently waiting for the ponies to get out of their way. Further in, past bike tour groups and village pubs, we saw ponies controlling traffic. I was in heaven. It was like a theme park custom designed for me: cobblestone streets, beautiful trees, sassy ponies everywhere you look. What struck me was the element of co-existence, this very human and very animal meeting place. 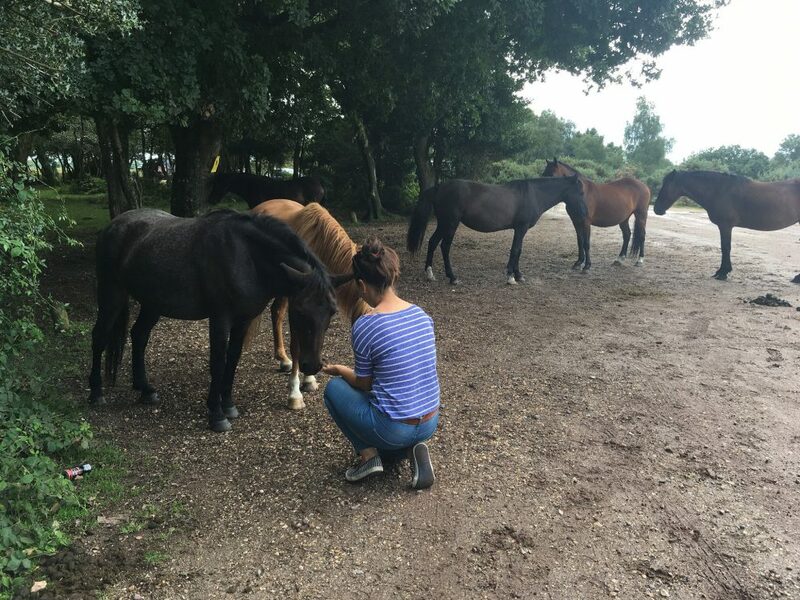 The way in which the ponies are generally ignored, endured, and respected, mostly as parts of the landscape of the New Forest, was lovely in an everyday sort of way. My own farm, and some farms I’ve worked at or been drawn to, have this feeling – everyone of all species going about their various businesses without segregation and without much trouble – but those are private settings created specifically by animal lovers. I’d had no idea this existed on a larger scale, especially in the busy, modern western world. The ponies are an attraction, to be sure, but they’re also just residents. I wonder how residents and visitors are affected by the constant, unforced contact with horses. Do they notice the effect? Do they miss it when they leave? Later, a little research revealed that the New Forest has been home to this kind of pony for thousands of years, and that the very structure of the ecosystem depends on free grazing animals. Without their constant landscaping, the brush would grow in and the biodiversity would shrink. Where I live, the brush is too thick to see through, let alone walk. But where the horses, goats and pigs have gone the forest has opened up, and I’m told that not so long ago the whole area was like that. I’m not sure if the change is due to climate change, or a big decline of wild animals grazing in the woods, or a combination of factors. In any case, as I explore land-management from a small-scale farming point of view I’m always fascinated by holistic practices that follow and guide natural processes, and use something potentially destructive – like grazing – to create life and maintain health. The New Forest herds (and the various cows, donkeys, Shetland ponies, and pigs) that roam the area are all owned by Commoners, or people who own or access land designated within the commons. To me, in a world of private property and No Trespassing signs, the concept of a commons – land collectively used, harvested and maintained – evokes community and shared respect for, and communion with, nature. In many ways the large-scale loss of the commons has been at the core of our species separating from the wild: privatizing small pieces of the world and denying, or even interrupting, the deep interconnection of all things has left us disjointed and set us apart. In the New Forest, the ponies are rounded up twice a year for inspection, branding and the like, and the breeding program is heavily managed, with only a handful of stallions allowed out during part of the year. There seems to be some contention between different groups – those that believe the ponies are over-breeding and over-grazing, and those that believe they are actually dwindling. It seems like the practice of Commoning is at a cross-roads as land ownership becomes more expensive and running livestock no longer a viable source of income. Like in so very many parts of the world, the fates of many lives and traditions currently teeter between sentimentality and practicality, and the risk of losing yet another bit of magic, a last vestige of connection, looms. 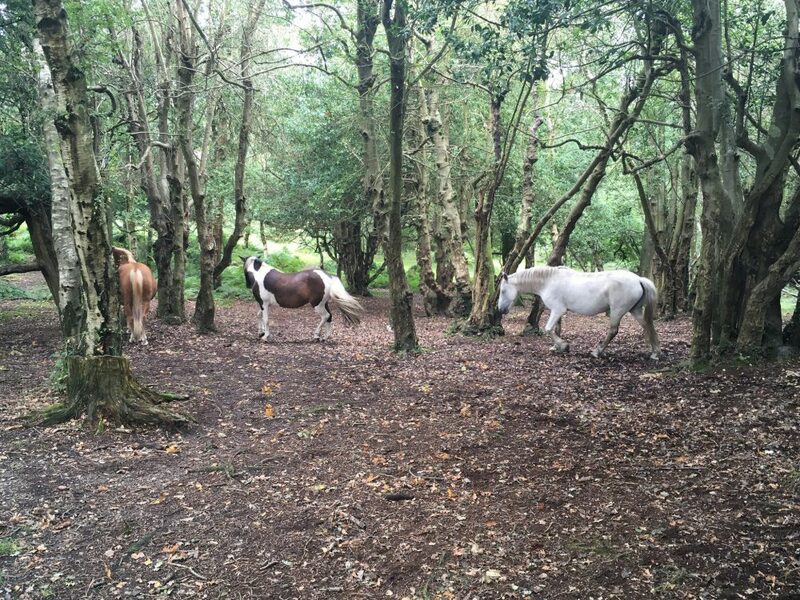 Even so, 5,000 ponies roam the New Forest and for now that makes me very glad. I left with great big gratitude for our little roan hostess and the many humans and animals that keep the New Forest alive and thriving. I left with wide open happy-eyes. Cool experience Kesia…Thanks for sharing. I have read some articles about the NF ponies. Mostly pertaining to hooves. I was wondering if you could give your thoughts? Especially as a trimmer who is as curious as I am about seeing and experimenting with hooves that are allowed to form with only movement and normal wear and tear. I am just curious if they were mostly all moving and functioning well? and or if there hooves were a mess and if you saw much or any lameness? I think most of what I read said all the ponies were pretty much laminatic and the hoof form was all splayed and flared….which the latter part I am personally witnessing with Banner and I am not sure how the long term will affect him? So far letting him self trim, and only helping the parts that want to release, seems to be doing him good, along with the increase in protein. ✌?️❤️? Should have known you’d be straight to the hooves 😉 I did of course peek at as many hooves as I could see. Most were okay, some were long and ski-tip flared. Not a lot of cracking or self-wearing as far as I could see – unless they spend a significant time on the roads, the ground is fairly soft and the climate is damp. 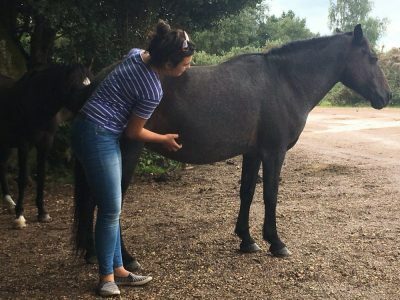 Lovely to hear you got to visit the New Forest ponies Kesia. I was lucky enough to spend a day with them too when I visited the UK in 2012. I have many happy memories of observing, connecting and delighting in seeing the many ponies and the environment they live in. A true horselovers theme park! We also saw herds of those lovely shaggy Highland cattle that co-existed with the ponies. Oh very cool, Cynthia! Yeah it’s kind of a dreamland… I didn’t see any cattle – but I absolutely love Highlanders. Your nursing observation makes sense! My two year old is still nursing – could be a good sign of health in the mares, too. WOW…. walking in their domain. As they allowed you into their space, enjoying their company, knowing and trusting you are no threat, but there to admire them and learn from them. What an experience for you and them…… I am sure you are planning a trip back some day?….Thanks for the pictures and your experience….. It was so lovely, Kenneth! I know that if I spend more extended time in England, I won’t have to go horse-hungry. Definitely going back – there’s a lot more I’d like to know about the place!